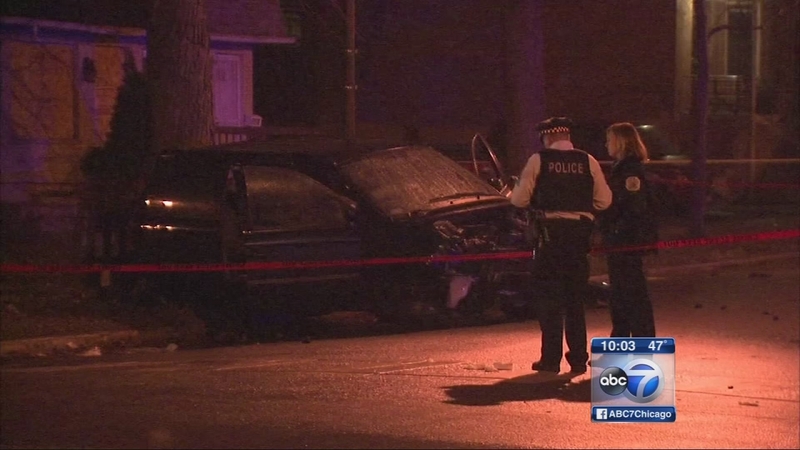 CHICAGO (WLS) -- One person was killed and 12 others were injured in a violent crash on the city's South Side Saturday that police say involved a stolen car after a short chase. Police say an unmarked squad car first identified a stolen vehicle and attempted to get the driver to pull over at 66th Street and May. Police said the vehicle failed to stop and the officers initially gave chase, but abandoned it after a short distance. The stolen vehicle ran a stop sign at 71st and Carpenter and struck another vehicle with eight people inside, killing 37-year-old Marie Carrion-Adame and injuring several, police said. Three men inside the stolen vehicle were also hurt and were taken into custody and hospitalized. They have been charged with possession of a stolen vehicle. Officials said 50 police officers and 11 ambulances wound up responding to the call.